Dog vs. Osama Bin Laden? 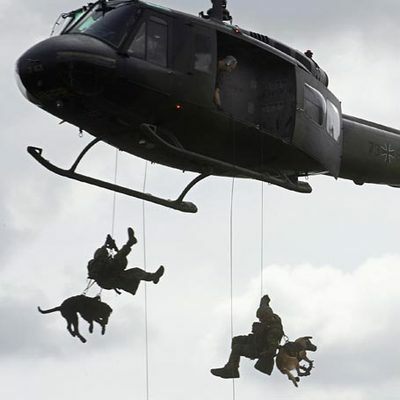 Dogs are routinely used in military operations. The reports are vague at best, but according to reliable sources, indeed a dog — likely a German Shepherd or Belgian Malinois — was involved in the raid on Osama Bin Laden’s compound in Pakistan. While no one’s claiming the dog pulled the trigger, some are calling him (or her?) a hero. I know I’m supposed to be swelling with pride, and I do feel a sense of resolution, but of course I can’t help wondering: Is lowering an animal from a military helicopter onto a potentially violent battlefield the right thing to do? From homing pigeons to soldiers on horseback to bomb-sniffing dogs, I know animals have long worked alongside human militia. Still, if there’s one area we humans have cornered the market, wouldn’t that be war? Is it ethical to draft dogs into combat? And what becomes of the dogs when they’re too old to work? What about the litters bred for such purposes, but whose pups don’t make the grade? Military canine training is not my area of expertise. I don’t know whether the end justifies the means, nor whether some of the dogs might just choose this path if given the option. I’m guessing it beats life in a shelter (hey, why not use shelter dogs then? ), but again it’s just conjecture. So I’m asking readers to share their knowledge and experience. And if you don’t have that, heck – respectfully crafted opinions are also welcome.